HABIT: Whorls of purple-pink flowers in summer. Small evergreen shrub with faintly aromatic leaves. 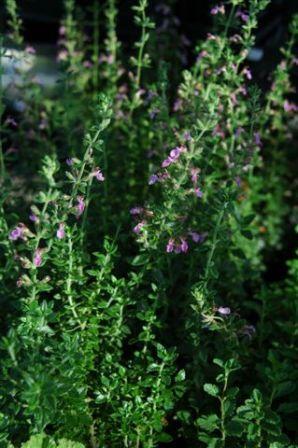 It may also be clipped into a border or low perennial hedge. CULTURE: Easy to grow, no particular cultural requirements. Propagate by seeds, cuttings, or divisions. Likes to be sheared. USES: Used almost exclusively as a landscape plant. Dark green attractive hedge or border. Fragrant foliage. Used in knot gardens. Excellent cut foliage for use in interior arrangements. HARVEST: Green foliage anytime to use with cut flowers indoors.